This Genk hotel is located 95 kilometers from Brussels and provides easy access to many Belgium recreational activities. 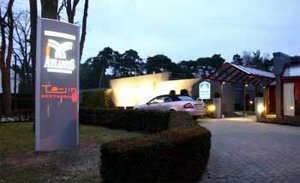 The Best Western Atlantis in Genk, Belgium is close to sporting attractions including the Horensbergdam go-kart circuit and racing events at the Circuit of Zolder. Hotel guests enjoy nearby recreational activities including golf, horseback riding and snow skiing. Guest rooms are equipped with cable satellite television, in-room movies, coffee or tea maker, hairdryer, work area with data ports and a trouser press. Other hotel amenities include a cocktail lounge, steam room, exercise facility and tennis courts. Guests of the Best Western Atlantis enjoy a daily complimentary continental breakfast and may experience French-Mediterranean fare at the in-house restaurant, Ta-Jin. This Genk hotel is less than two kilometers from a train and bus terminal. A smart choice for travelers, the hotel is also 25 kilometers from Maastricht International Airport and 90 kilometers from Brussels International Airport. Make an online reservation today at the Best Western Atlantis!